AshitoKenji joined on Apr 11th, 2014, since that has made 439 posts that are still accessible today, 2 of which are threads. Helping shape the community, AshitoKenji has given 634 upvotes, and was last online on Apr 11th, 2019.
up against the champion first up.... lucky me? So I started writing this heaps long ago and just finally got around to finishing it and editing it. Read with some sad music playing or something because it's supposed to be sad. Enjoy! New Years Eve. Wasn't it supposed to be a fun day? Full of laughter and joy? Well, unfortunately for us, today wasn't like that at all. We were all standing around the water, watching the view of the city below us. The waterfall crashed down next to us and Farris even tried jumping in, until we smacked him across the face a few times telling him that it was a stupid idea. BakaHime jumped and played, exploring the area with EvoRulz and Koushiro by her side. They were trying to uncover some mystery that they had made up. They were hopeless. Obviously they wouldn't figure it out, it wasn't real! Gwynn was acting like the motherly figure that she was and had already started setting up our picnic. She had cooked all of the food herself. Gwynn was amazing in the kitchen. Off to the side Lieutenant and Kirn were sitting on a bench chair. It kind of looked as if they were looking down on the rest of the city. Knowing them, they probably were. Enami was still scolding Farris by the rushing water, but soon after they both started helping Gwynn set up the food. I was enjoying myself just by watching the others have a good time, that's all that I needed. A few hours later we were all sat around eating and laughing. The sun was setting, engulfing the city in pretty shades of pinks and oranges. I loved sunsets, they made me feel so relaxed. All of us were quite the crazy crew, most people would wonder how we ended up all together as friends. Well, the reason for that could easily be explained with one name: BakaHime. It was her, the playful idiot that somehow managed to find all of us and bring us together. The thing is, we all had some kind of tragic part of our lives that held us back and stopped us from being happy. BakaHime saved all of us from that part of our lives. "Ashi stop daydreaming and start eating, you silly," Gwynn giggled, throwing a piece of bread at me to break me out of my thoughts. "With BakaHime around you better eat fast or there will be nothing left!" Enami joked, and we all laughed. Well, all of us except for BakaHime, who just stuffed her face even more. "You seem zoned out today Ashito, what's wrong?" Lieutenant asked, seemingly concerned. How could she tell? I had a pretty bad feeling about today, but just couldn't quite put my finger on it. "Just upset that I didn't bring a telescope. Could have spied on so many cute boys from up here." Once again everybody laughed, but it all felt fake, even though I knew this wasn't a dream. "You don't need a telescope, there's a cute boy right here!" EvoRulz exclaimed, causing once more for laughter to fill my ears. "Not my type." I stated blatantly. We all continued eating until soon enough there was nothing left, and the sun was no longer visible. All the vibrant pinks and warm oranges had disappeared and were replaced with the moonlight dark sky, stars scattered all across. I didn't quite enjoy the night sky as much as a nice sunset, though. Kirn walked over to his car and grabbed out a bunch of party poppers and sparklers. "It's almost time, guys!" He called out, and everyone gathered around the edge of the cliff so we could all watch over the city as we continued to the next year. "Only one minute left!" Koushiro shouted, already ready to light his sparkler and party. "Guys I just want to say something quicky!" Gwynn started. "Okay so, I just want to say that I hope that we all can have so many fun times like today in the year to come. I love you all so much and couldn't imagine a life without you." "3... 2... 1.. HAPPY NEW YEAR!" We all called out together, as we pulled our party poppers and lit our sparklers. That's when it happened. The moment that I would never be able to forget for the rest of my life. The world slowed down, the breeze of the wind halted. The shining stars, illuminating the whole world with their sparkle... faded. "Ahhhh!" BakaHime screached, and all eyes were immediately on the falling body, plunging towards the ground beneath her at a deahtly speed. She had slipped and fallen off the cliff. "Baka!" We called out, completely shocked. Her body fell in slow motion, her eyes locked with mine for a split second and at that moment I realised that there was absolutely no way anyone could survive that fall. Her body somehow managed to hit the water, but from this height there was still no way that she could have survived. "We have to do something!" Enami called out, and we all began our run down to the water where BakaHime had hit. All of us searched and called out for her, we still had hope that she would jump out saying "gotcha, I'm fine!" or "woah that was super scary" in her innocently stupid way. But we all knew that we wouldn't find her. That didn't stop us, though. For hours we searched, holding onto the small hope that we had left. For some reason none of us thought to even call an ambulance or the police, I guess it was the shock. Or maybe none of us wanted to waste time calling anyone when we could have been searching ourselves. "BakaHime!" I heard EvoRulz call out from the distance. "BakaHime where are you!?" 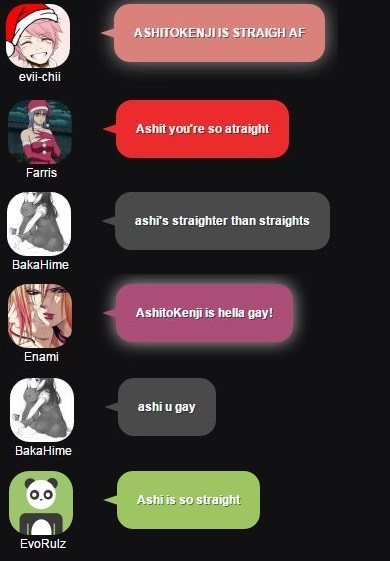 Koushiro called. "BakaHime stop playing around this isn't funny anymore!" Gwynn cried out. "BAKAHIME!" I screamed out into the air, hoping that somehow if I screamed loud enough she would come back. And then everything went silent for a little while. All the trees stopped moving and even the river had stilled. BakaHime was dead.. and we all knew it now. I started to hear the small sobs coming around as everyone slowly made their way, forming our little group. We were all crying now, mourning the loss of one of our best friends. The idiot, leave it to her to get herself killed. BakaHime, the one girl who brought all of us together. The one who single handedly helped each and every one of us get through the toughest times in our lives. She was gone. I fell to my knees as my legs couldn't carry me any longer. I was exhausted, we all were. I looked around at everyone's pained faces, and realised that someone else was missing. "Where's Kirn?" I asked between my sobs, and the others looked up and glanced around. "He's probably still searching, the idiot. I'll go look for him." Lieu paused for a moment before continuing, a tear streaking down her cheek, "he was quite fond of the little fool." And with that Lieu walked away, and we didn't see her or Kirn for the rest of the night. We all ended up going to Gwynn's house for the night so we could comfort each other and mourn together. That's how our new year started.